St. Paul, Minnesota (March 25, 2019)--Recent advances in next-generation sequencing technologies have allowed scientists to access and assess previously undetectable plant microorganisms. Scientists have long known that various plant-associated microorganisms contribute to plant health and productivity but were unable to analyze them in plant seeds due to technical restrictions. Thanks to the enhanced development of high-throughput sequencing methods, plant seed microbiomes have been increasingly studied. In a study published in the fully open access Phytobiomes Journal, a group of scientists led by Tomislav Cernava utilized this new technology and were the first to assess the seed microbiomes of two successive plant generations of tomato plants, selected due to its importance to the human diet. The team identified and characterized microbial communities in different compartments of the tomato. The research showed that seed endophytes (microorganisms found in inner seed tissues) have distinct compositions and harbor different beneficial bacteria. The team also found that plant seeds were an important vector for the transmission of beneficial microorganisms across generations. Notably, they found that the seed is an important vehicle of plant growth-promoting bacteria. 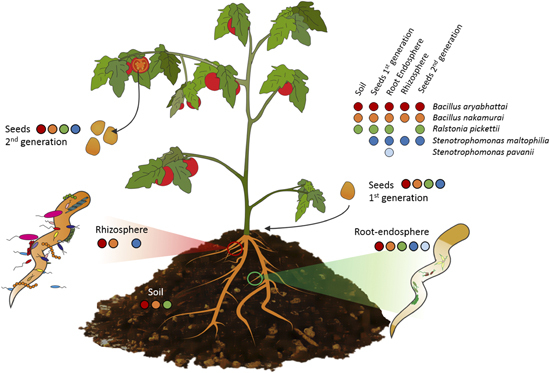 Graphical representation of the plant system including microhabitat associations of analyzed isolates from the tomato endosphere. All identified bacteria with plant growth-promoting effects were linked to the microhabitats they were found to be associated with by colored dots. Both seed generations are included in the model. More details about this study can be found in Tomato Seeds Preferably Transmit Plant Beneficial Endophytes published March 6, 2019 in Phytobiomes Journal Volume 2, Number 4. Phytobiomes is a fully open access, transdisciplinary journal of sustainable plant productivity, published by The American Phytopathological Society. Phytobiomes publishes original research about organisms and communities and their interaction with plants in any ecosystem. It also provides an international platform for fundamental, translational, and integrated research that accomplishes the overarching objective of offering a new vision for agriculture in which sustainable crop productivity is achieved through a systems-level understanding of the diverse interacting components of the phytobiome. These components include plant pathogens, insects, soil, microbes, weeds, biochemistry, climate, and many others. Follow us on Twitter @PhytobiomesJ and visit www.phytobiomesjournal.org to learn more.